Have you ever bought a curriculum that you thought would be great, only to find out that it just wasn’t a good fit for your family? Don’t worry I have some advice in today’s Tip Tuesday post that will hopefully encourage you to let it go and move on to better homeschooling days! We’ve all done it, bought something or tried something new that just doesn’t work out. So what do you do with it? Do you tough it out for the rest of the year, or let it go? What about the cost of the curriculum? Certainly we don’t want to be wasteful with our money, or curriculum. 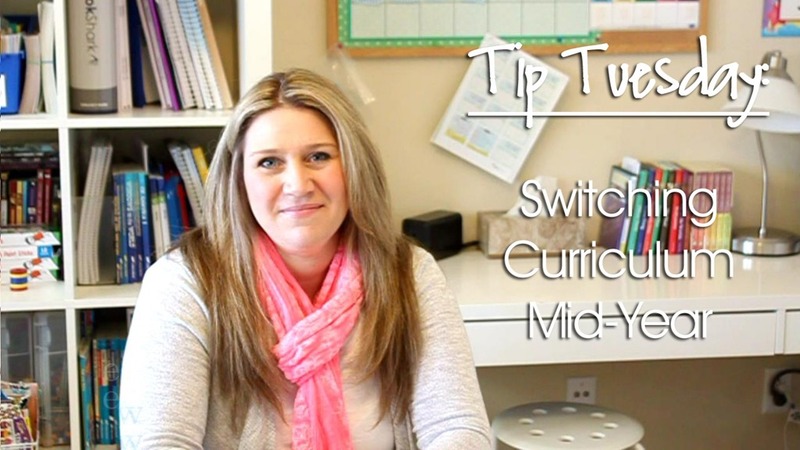 Find out my opinions on switching curriculum mid-year, and how I recuperate any lost money in the process! Check out today’s Tip Tuesday video on Switching Curriculum Mid-Year to find out more! I hope today’s Tip Tuesday helps to encourage you on your homeschooling journey! If you have a tip to share, or want to have me do a Tip Tuesday on a topic, make sure to leave a comment below! Another great video, Erica. This is something I have struggled with. We tried a foreign language program at the beginning of the year. We thought it would be amazing, but it was anything but. It took me a while to drop it (especially since I don’t have a back up plan), but we’ll try again next year. Thanks for another great tip. (btw… oops… I think you meant to type “recuperate” up above 🙂 Have a wonderful week! Oops, yes, thanks fixed it LOL! I live in an area where I am very limited for internet and what I can get doesn’t allow me to watch much video (eats up all my monthly allowance). Have you thought about offering transcripts of your video’s for people in my situation? Pam, that is a great idea. It’s hard being rural, isn’t it? That is great advice! I’m really struggling this year with my daughter and I even suggested to my husband just last night that we put her back in school! I hate to re-spend money and I hate the thought of “giving up” on a program, but you are right- It is NOT worth the stress. I have discovered that when it comes to math my daughter is just going to hate everything but it has to get done. Thank you for the post and the great reminder that its okay to shelve something and try something different. Thank you so much for doing this video! It’s good to know that not everyone is able to just stick with their curriculum. We have to change often, as a medical condition for my child changes often. You are my go to person, when needing a change or just a look into things, because you have made it simplified. Thank you! Hi! I’m wondering if you would start over completely with a curriculum? We’ve had life happen and we are only on week 11 for this year with a program that’s not working for us. Should we start over completely? We came across this situation a couple times and when we changed curriculum mid-year–to something that worked–we were able to nearly double the progress and then finished up in the summer. The change in attitude and degree of actual learning retention was so worth it. When you go from frustration and tears to somewhere between calm resign and acceptance, it is refreshing. NO PERSON CAN RETAIN TRUE LEARNING KNOWLEDGE WHEN EMOTIONS TAKE OVER–a completely different part of the brain is engaged! I agree with Donna! We were able to skip ahead a little bit, then we just let our lessons spill over into our summer which was fine. Sometimes you can also double up on lessons to help get caught up too. But remember, part of the point of switching may be that you have a struggling student. In that case you might want to just start with the new curriculum at lesson 1 then move through at a pace that works for your student. It’s more important to learn the material than to try and rush to get caught up. Was the Math curriculum you were using Math in Logic or Singapore Math? We have our son in a University Model school, and this is what they use. He’s in 4th grade. It has been such a struggle this year! I mean struggle!! Not only for our son but for me as well. We spend two hours minimum on Math. Most days result in tears. I asked the school if we could just use our own Math, since it is co-teaching. They said it was fine, but strongly discouraged it. So here we are mid February, and it certainly too late now. I told my husband that I don’t think that he’s gotten anything out of the school year. If he were tested, I’m afraid he wouldn’t test at 4th grade level. I am so discouraged! Any advice would be so appreciated! We have been doing Saxon grade 1 this year. Its now May and we are a little over halfway through.. the younger grades are so MUCH work.. its hours on math. I bought TT3 (everyone says its a year behind) for next year but am at a loss for what do for the rest of this year. Math is so hard. The different curriculum methods make it hard to jump into something in the middle. I’m currently searching for something to get us ready for TT3! !